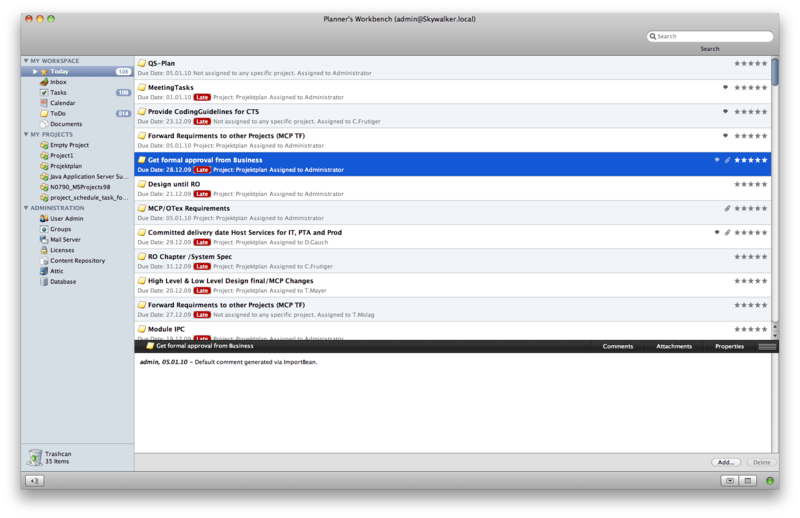 This is a little status update on Collapp, formerly known as “Planner’s Workbench”. I figured that the name was simply too long, so I renamed it to something shorter and more catchy. Please feel free to leave a comment regarding the naming. I still consider it a working title and I am open for alternatives. Important is only that it is a one word name. This post is an update because Collapp has been featured before on Ken Orr´s blog. Ken is the author of MacWidgets, a framework for creating Swing clients that look right on MacOS X. Collapp makes very heavy use of MacWidgets, as you can see in the snapshots below. The initial plan was to release a first public beta of Collapp in the summer of 2009. But unfortunately license sales of my FlexGantt UI framework for Java/Swing declined and I had to start freelancing again. I am now working part-time for Credit Suisse in Zurich. This means less time for coding and even worse: it gave me plenty of ideas for new features. Especially since the poor guys at Credit Suisse carry quite a burden in regards to project planning. Right now I think that nobody needs my new app more than they do. 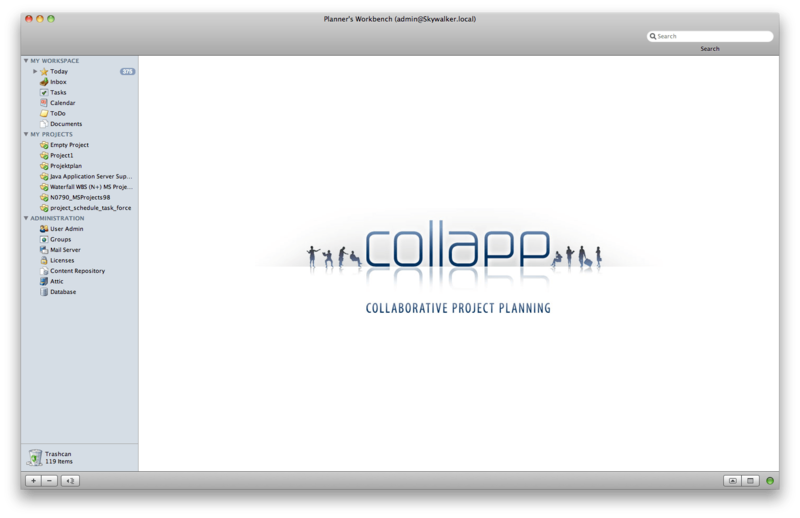 The idea behind Collapp is to provide a single planning tool both for the project leader and the team members. A project lead can create a project, add team members, create and assign tasks. 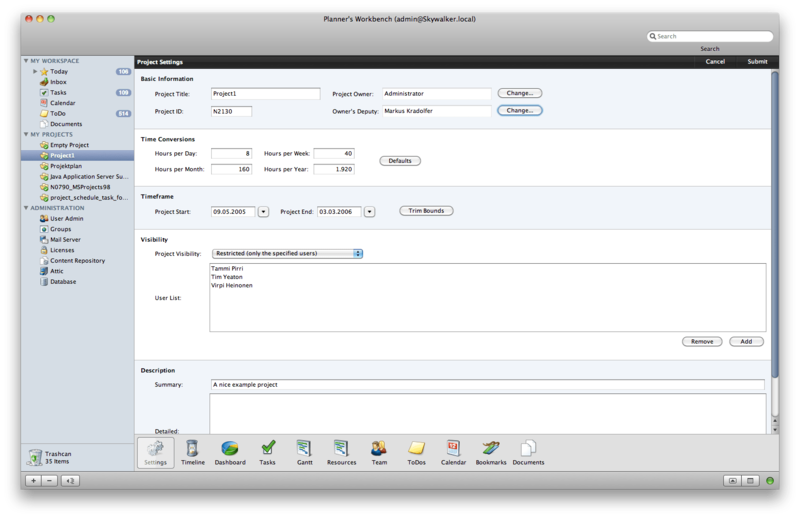 Team members can view the tasks assigned to them and report feedback via comments or the percentage complete attribute. The next snapshot shows the most important view provided by Collapp for regular team members, the “Today” list. Here the team member can see which tasks, todo items, and calendar entries, are due today. A view like this one facilitates the “Get Things Done (GTD)” approach. The next screen shows the todo browser. It uses the “column browser” feature that most of us know from ITunes. The difference between todos and tasks is that tasks are created by the project lead as part of an overall project plan, while todos can be created by anyone. Tasks are high level (e.g. “deploy application”), while todos are fine-grained (“talk to operations team about good deployment date”). Software developers can think of todos as issues / tickets, but without the whole workflow behind them. The task screen will look very similar to the todo screen but it is not done, yet. Something I noticed many times is that project leads often do not have information about the availability of their resources. It is quite common that a team member will say that he was unable to complete a task because of this and that and that the project lead should have known that. Yes, in a perfect world, maybe. In the real world the project lead works on many things at the same time and can’t possible remember the schedule of every team member. Collapp offers two calendars for each user. One to model the work week (mo-fr 8am-12pm, 1pm-5pm) and one for actual appointments, meetings, general unavailability. This information will be visible to the project lead in the Gantt chart screen (not done, yet). 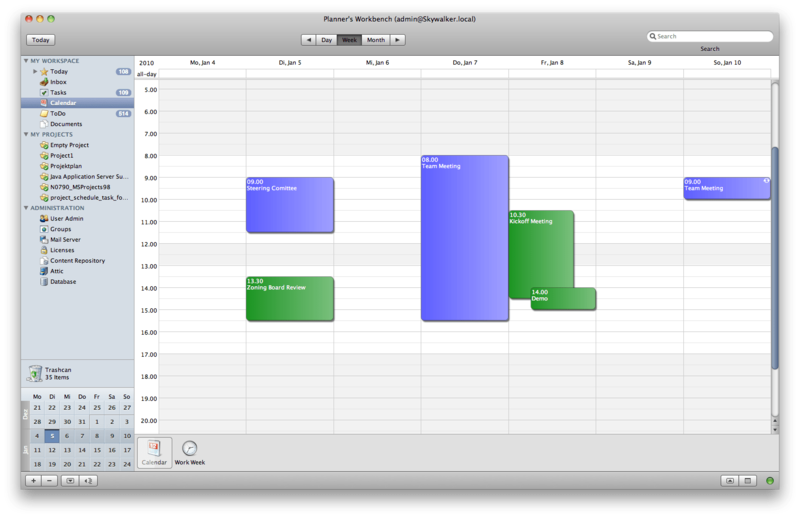 So far we have seen list views (today list), table views (todo browser), and graphical views (calendar). A fourth kind that is very typical for any database driven application is a form view. The screen below shows how this looks like in Collapp. The user has to unlock a form before making any changes. This ensures that two users are not making changes at the same time, hence overriding each others changes. The form shown in the screen is the one used for making changes to the general project settings (start time, end time, project owner, visiblity, etc…). Whenever I used project planning software (especially MSProject) I soon got the feeling of being lost. I didn’t know “where” I was in my project, meaning I didn’t know whether I am in a certain phase or which milestones have actually been reached. I always missed a summary / overview feature. 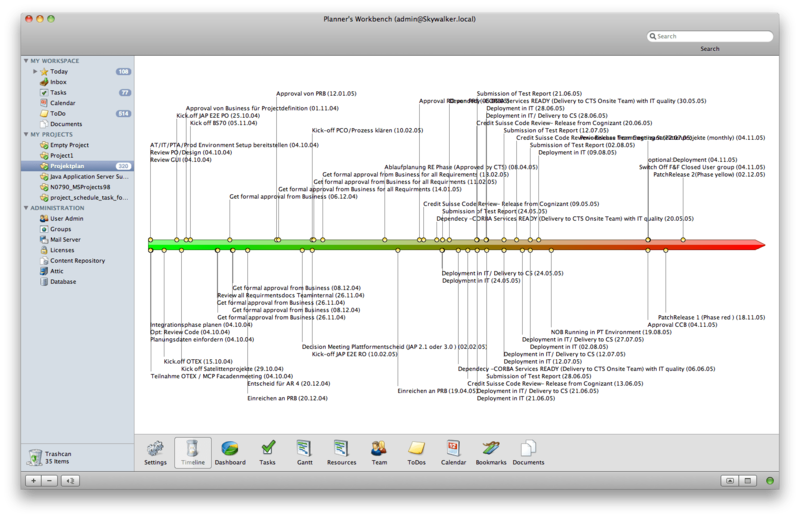 To address this issue I added a “Timeline” view to Collapp, which is shown below. This view is still under heavy development but I think you can already see where I am going with this. This is it for now. Any feedback is very welcome. Let me know which live-saving feature you miss the most in existing project planning software and I will see if I can address it with Collapp. This is looking really nice Dirk! This looks great. I hope you will submit it to the Java Store. This is still a really early release and the scheduling logic in the Gantt chart is not really functional, yet, at least the automatic part of it. So scheduling is very very manual right now. But the demo should be able to give you an idea on how this whole thing is supposed to work. Note: the calendar UI didn´t make it into this release. I have released a first version of Collapp Action Tracker (1.0.0) on my website at https://www.dlsc.com. Everything for installing Collapp can be downloaded from there. A Java Webstart demo is also available via the “Collapp / Online Demo” link on my site.